Friends of Orchha is a registered non-profit organisation working in Madhya Pradesh, India on creating livelihoods linked to tourism, preserving the environment of heritage sites like Orchha and promoting cultural exchange between visitors and locals. Interaction with a group of women from a poor neighbourhood of Orchha was the spark that led to the creation of Orchha Home-stay, a social enterprise that creates incomes and assets for families below poverty line while providing a rich cultural experience for both visitors and hosts. The activities of the organisation are financed by individuals and by a few other development aid agencies. Friends of Orchha, registered as Orchha Mitra Vikas Samiti is guided by a Managing Committee of seven persons from Orchha, Tikamgarh, Almora and Delhi. If you share the aims of our organisation and wish to join us, please send us an e-mail. We will be happy to welcome you and have you participate in the Annual General Meeting held in Orchha. The organisation was founded by Asha D'Souza and Louk Vreeswijk, an Indo/Swiss - Dutch couple, who moved from Geneva to Orchha in 2006. They managed it for ten years. In April 2018, they handed it over to Romi Samele. Two other stasff members, Ramsevak Valmiki and Jumna Prajapati do the house-keeping of the guest rooms, toilets and bathing rooms daily. 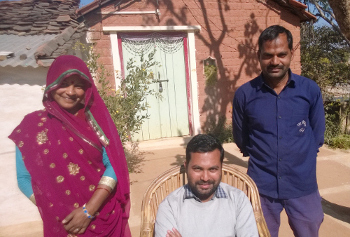 A group of interested persons living in or near Orchha have joined the Managing Committee of the organisation of which Asha continues to be a member.